Mr. Satie has to decide whose paintings are better - Henri or Pablo. His decision ends up uniting the two artists and ending their feud. 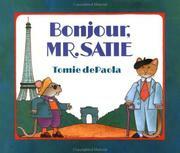 dePaola, Tomie, “Bonjour, mr. satie,” Children's Picture Book Database at Miami University, accessed April 25, 2019, https://dlp.lib.miamioh.edu/picturebook/items/show/8095.